We specialize in electrical, software design services with multiple years of medical regulated environment. Sprintek utilizes its FlexMatrix™ keyboard encoder ICs and smooth motion analog pointing stick modules technologies in custom silicone rubber keyboards. The years of experience lets us build the most robust and the most flexible industrial keyboards for our customers. We have more than 20 years of development experience in HID product and design. We can quickly provide customized keyboard and mouse designs for sensors with USB, PS/2, serial, SPI and wireless interfaces. 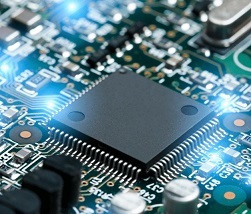 We provide full design services from electronic cuicuit design and PCB layout to firmware and test software. Our talented engineers have experience in electronics circuit, firmware and software designs for such applications as medical instrument, industrial automation, IT business information system. Microcontrollers: TI, NXP, ST ARM Cortex-M0, M3, M4 32-bit MCUs, TI MSP430 16-bit MCUs, Microchip PIC16, 18, 24, 32 MCUs, Cypress PSOC 8-bit, 8051 MCUs, Silicon Labs 8051 8-bit MCUs, Holtek MCUs, and Renesas MCUs. Firmware Programming Tools: IAR, Keil, MPLAB C, XC, PSOC Designer (C, C++, Assembly). Desktop Software Tools: Microsoft Visual Studio versions (C#, C++, VB), QT, Python, VBA, and Labview. Circuit Design Tools: ORCAD. Communication Protocols: Ethernet, USB, I2C, SPI, UART, RS-485, CAN, Ethercat, PS/2 and etc.